Arghhh, matey... Pirate theme birthday party tiki bar decor. Strong, Sturdy, High Quality and Stylish. Durable for Daily Use. Perfect everyday kitchen dining home bar use or Halloween decorations. Generous 16 oz Pint size is just the right addition for any MAN CAVE, for serving beer, soft drinks, cocktails or favorite holiday beverages. 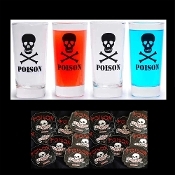 *Includes 16-piece (2-8-pc pkgs) hardboard POISON SKULL BEWARE COASTERS SET to complete the display! Skull and Crossbones Poison design drink glasses are just the right all occasion gift to celebrate Christmas, Holiday, Birthday, Wedding, Valentine's Day, Anniversary, Halloween, Father's Day, Mother's Day, Housewarming, Retirement, Office Events, New Years, College Graduation, St. Patrick's Day, Congratulations, Job Promotion, New Job, Stocking Stuffers and Secret Santa surprises!